Hsiu-Lan Chang is a globalist with a far reaching vision rooted in community volunteerism. Shaped by her long sojourn through Tokyo, Hong Kong, Paris and Monte Carlo before finally settling in Brookline, Massachusetts, she speaks her native Shanghainese, French, Italian, Japanese and English. But perhaps the most important language she speaks is the “unspoken language” of different cultures honed from her multicultural experiences. It is this unspoken language that communicates eloquently to business associates, community leaders, strangers and friends alike. Born in Hong Kong to parents who had fled a chaotic Shanghai on the verge of civil war, Hsiu-Lan lived in Tokyo for 20 years. There, at the age of 16, she began what has become a lifetime of activism by defying the mandate of her traditional Chinese family to get married. Instead, she won a scholarship to the University of the Sacred Heart in Tokyo where she obtained her Bachelor’s degree. Hsiu-Lan continued to pursue her independence when she returned to Hong Kong. She obtained her first job at a prominent Hong Kong institution at a time when few women were working and to date, she has amassed over 30 years of experience in strategic development, international negotiations, marketing and sales. Her career has spanned major companies in diverse sectors ranging from Sony (electronics), Seibu (distribution) and Mitsui (global trading), to Pierre Cardin (fashion and licensing), Matuschka Group (investment banking) and Batterymarch Financial Management (institutional asset management). She was coined in The European as “The Banker Who Made Her Own Good Luck”. She became the first woman to be featured on the cover of the French business publication A Pour Affaires. She has been interviewed in Contemporaine, German Elle, Mergers & Acquisitions and French Fortune. In the 1990’s, she was the inspiration behind a fictional heroine of a French bestseller, “La Statregie du Nenuphar” by Colin and Vidrequin. Today, Hsiu-Lan continues her career of independence and entrepreneurship by establishing FastFrame of Brookline. She achieved record first month sales and won the 2006 Rookie of the Year Award from the International Franchise Association and the 2006 New Business of the Year Award from the Brookline Chamber of Commerce. She is featured in “Smart Women Small Business” a book by Virginia Wlimerding for budding women entrepreneurs. 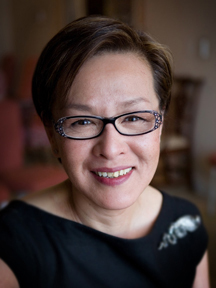 Hsiu-Lan is a founding member and Chair of The Friends of Madame White Snake, a grass roots organization dedicated to building cultural, ethnic and international bridges in Boston and China through a groundbreaking recreation of China’s 1,000 year old legend of the White Snake. This story of an indomitable spirit striving for her life’s dream despite impossible odds resonated strongly with her. She saw in it the possibility of the “butterfly effect” – for small actions by individuals, like the flapping of a butterfly’s wings, to have potentially far reaching effects across Eastern and Western cultures and even across continents. She was not disappointed. The Beijing Music Festival, the premiere presenting performing arts organization in China, has signed on not just as the presenter of Madame White Snake’s China Premiere, but as its co-commissioner with Opera Boston. She is now working to bring in different neighborhood and community groups as partners in a multitude of education and outreach programs revolving around Madame White Snake themes for the Greater Boston communities. In addition, Hsiu-Lan is a Trustee of the Brookline Community Foundation and a member of the Board of Overseers of the Brookline High School 21st Century Fund. She is a founding member of the JA Lynch Committee against Domestic Violence and a member of the Rotary Club. She was Senior Vice President of the Brookline Chamber of Commerce and Past President of the Driscoll School Extended Day Program. She is an active supporter of the Brookline Teen Center Initiative and was a Fundraising Co-Chair of its first Annual Brookline Community Basketball Tournament to raise awareness and seed money for this important community initiative. She thoroughly enjoys being in the cast of Artbarn’s annual theater production which benefits local children’s theatre.